This is such a simple & healthy dessert to make. It is packed full of anti-oxidants, fibre & vitamin C.
Mix sultanas, coconut sugar, cinnamon, & maple syrup in a bowl until combines. Using your fingers push the sultana mixture into each apple. Stud a few cloves into each apple skin. Cook for approximately 45 minutes to one hour depending on the size of your apples. Before serving remove cloves & serve with coconut yogurt or coconut ice-cream. A baked apple is one of the easiest, healthiest desserts to make. They are packed full of vitamin C are high in fibre. They also contain pectin which is a nutrient that helps prevent cholesterol from building up in the blood vessels. Apples polyphenols can help support the balancing of blood sugar levels. Sultanas are a rich source of energy, vitamins & minerals especially vitamin C.
They contain a phytochemical compound resveratrol, which is an anti-oxidant, that has anti-inflammatory properties. Studies suggest it has anti-cancer, blood cholesterol lowering activities. Coconut sugar has a lower glycemic index than regular table sugar. It contains a fibre called inulin & it benefits from the many nutrients found in the coconut palm. Cinnamon helps balance blood sugar levels & it contains manganese, calcium, iron, & vitamin k. Research suggests cinnamon has a positive effect on immunity & digestion. Stronger doses of cinnamon can be beneficial for improving heart disease risk & reducing the risk of diabetes, cancer & neuro-degenerative diseases. Cloves are noted for their antioxidant, antiseptic & anti-inflammatory qualities. They also have warming & soothing qualities. Cloves are also carminative & have anti-flatulent properties. 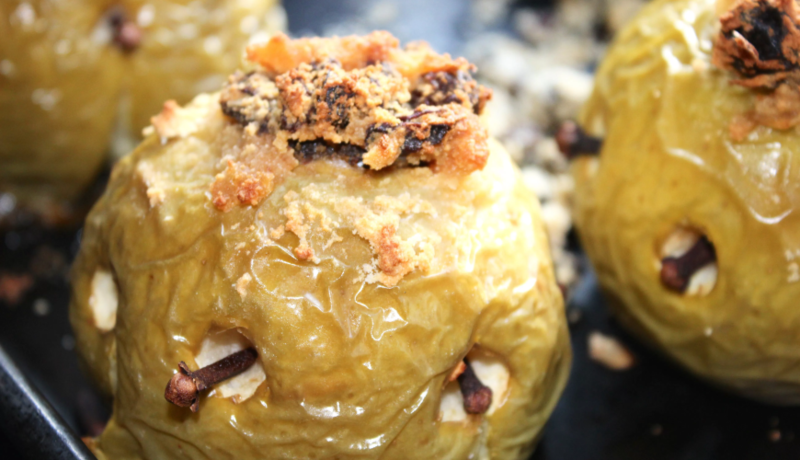 They offer a delicious warming flavour to this recipe & work extremely well with apples. I have chosen to use coconut yogurt or coconut ice-cream with this recipe because they are non-diary & compliment the apples & sultanas deliciousely.